Should I Buy a Home in the Poconos in 2019? What are some of the things that you should take into consideration before making a decision? Obviously, finances will play a big role in your decision. Is now a good time to make this kind of move? Not all of the factors are financial in nature. Your own needs should be a major factor as well. Let’s look at a few things to think about—both financially and with regard to your personal needs. As a prospective new-home buyer, you’ll want to keep an eye on interest rates. Changes in mortgage interest rates can have a significant impact on the affordability of your home. 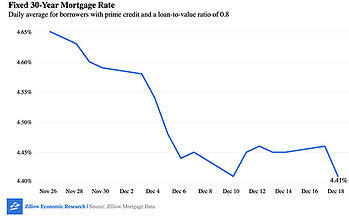 At the time of this writing, interest rates are still very attractive for homebuyers. As you can see from the chart (courtesy of Zillow Research) interest rates (for a 30-year mortgage) right before Christmas were at 4.41% (actually down from November). Naturally, the big question is where are the rates headed. Zillow projects that 30-year fixed mortgage rates are headed toward 5.8% in 2019. While that’s not a huge jump, it can significantly affect your home’s affordability. We’re builders, not financial advisors or lenders. Still, there have been signs for some time that mortgage interests will be headed up. They are still affordable now. If you’re serious about making a purchase, it’s smart to get your financing lined up ahead of time. Seeing what you actually qualify for can help you make decisions about what you can realistically afford before you spend a lot of time looking at possibilities. While finances are a big factor in purchasing a new home, there is more to the picture. You may be looking at changes in your personal needs. What if your family is expanding? That may mean you’ll need additional space. A new baby on the way could necessitate more living space. Or you may find yourself caring for an aging parent and needing space that allows you do to that comfortably. Your own needs may be changing as well. If you’re a more mature homeowner you may want to make sure that your next home remains comfortable, convenient, and safe as you mature. Making a move later in life can be stressful. That’s one good reason to consider a new home now that is designed to meet both your current needs and your future needs. Here’s a helpful post about what to consider if you want to create a home that meets your needs as you mature. By planning ahead you can make a move comfortably before it becomes an overwhelming experience. In many ways, this is a win/win situation. Housing prices and mortgage rates aren't likely to go down in the coming years. Making a move now will probably cost you less than it will later. Plus, you’ll have the added advantage of enjoying your new home now—and the peace of mind that comes from knowing it will serve your needs for years to come. So, is 2019 the time to buy a new home in the Poconos? That, of course, depends on your specific situation. It’s always a good time to pre-qualify for your loan so that you know exactly what makes financial sense for you. And it’s a good time to gather information about your building options. I invite you to check out some of the communities in the Poconos where we build so that you can get a feel for what life in the Poconos is all about. And take a look at our custom home design library to get an idea of what kind of home best fits your specific needs. But don’t worry! You’re not locked into the plans you’ll see. We want to create your perfect home! If you don't like something or would like it to be different, we can change, adjust, or redesign your home floor plan to suit your needs!